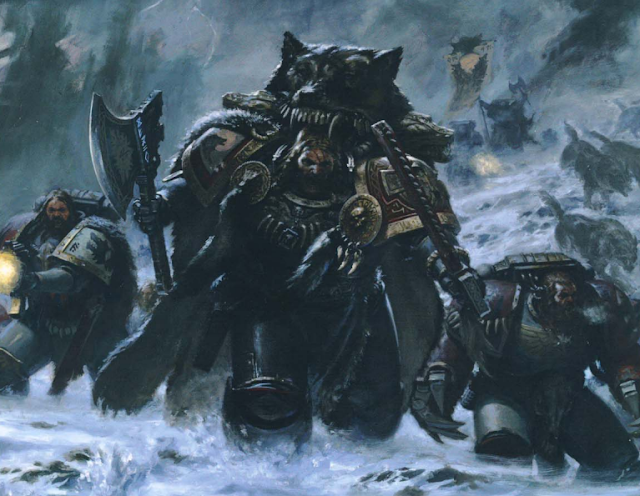 Well, it has been three yeas since my younger sister Sarah and I agreed to stop playing games and start working on getting her Space Wolf Army into a playable state. We were using it in pieces before but after some confusion as to who was who, we realized we really needed to get some finished units onto the table. 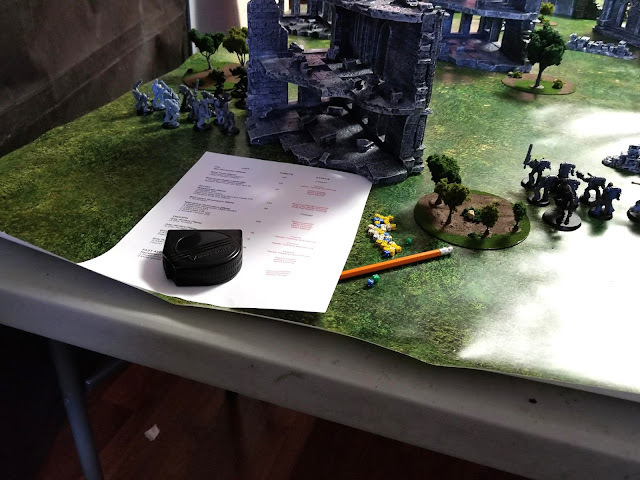 So after all of this time, we are finally ready to go and on Friday March 30th we got the tabletop set, the rule books out, and started planning our armies. Currently the only two armies that we have available are my Sister's Space Wolf army, and my Death Guard army comprised of many pieces that I owned (and had to drastically repaint) in my childhood. So of course those were the armies. Now when we stopped playing, 7th ed was just getting started, so we decided to pick up where we left off, which was 6th edition. We will likely move forward and check out 7th and 8th, but at JADE we tend to hope around from Rule Set to Rule Set when we feel like it, so for this game we played it in 6th. So rather than using the 5th ed codex, as is legal in 6th edition for Space Wolves, Sarah has built her army using the Space Wolf 7th ed Codex. Personally I think it is a better match for the 6th ed Chaos Space Marine Codex, as they are written in the same style. This army was largely made so that Sarah could field a large force with as many intact models as she had available. It is certainly not the best list but a good simple introduction back into the game. 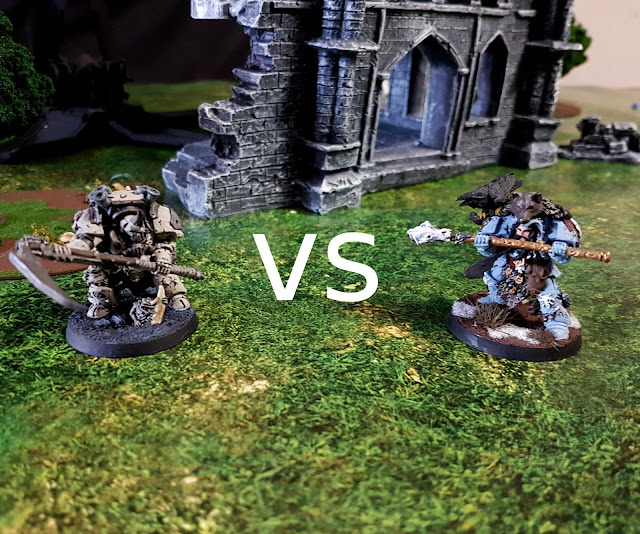 I built this force to match Sarah's Space Wolf army; Not to destroy it, but to provide something that I thought would be a fun match, and to give me a chance to try out a few of my more powerful units that I have only recently painted myself. While our terrain might not be the best in the business, for us this was the best looking tabletop we had ever played on. For the first time since I was a teenager we had access to an appropriate playing area: three tables we could combine into a 6ft x 4ft area. 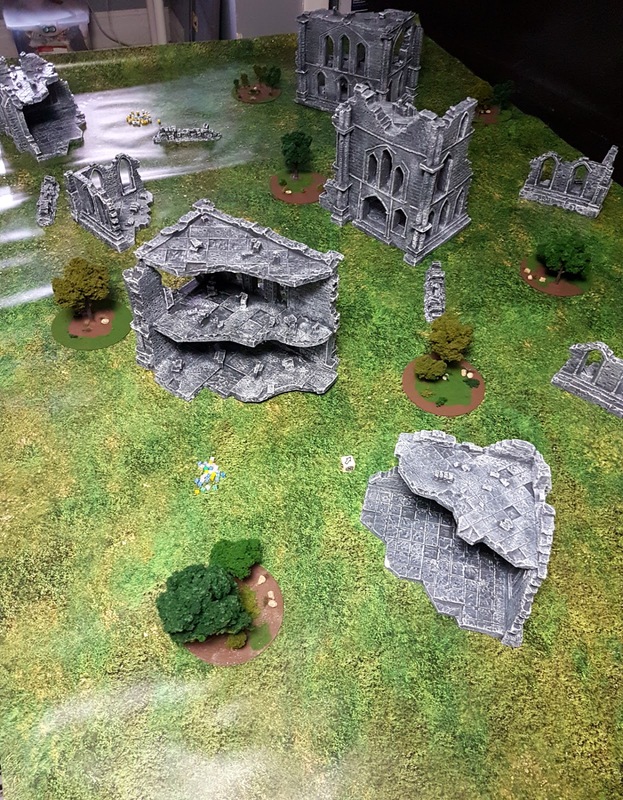 We also had better looking terrain then we ever had before. Over the years I had purchased a number of gaming mats and terrain pieces from a company called Urban Matz. They are a little pricey, but their products are of excellent quality. All of my ruined gothic buildings, and the grass mat come from them. My tree bases are homemade using blank CDs, model railroad trees from Woodland Scenics, and some flock. They make for great scatter terrain pieces and fit out overgrown and ruined city perfectly. Like 99% of Warhammer 40k games our first turns were incredibly uneventful. However as we began moving our forces I realized that my Right flank would easily be over powered by the mass of troops that Sarah had inching towards me. I also realized that I had not set up my units in the most advantageous position. 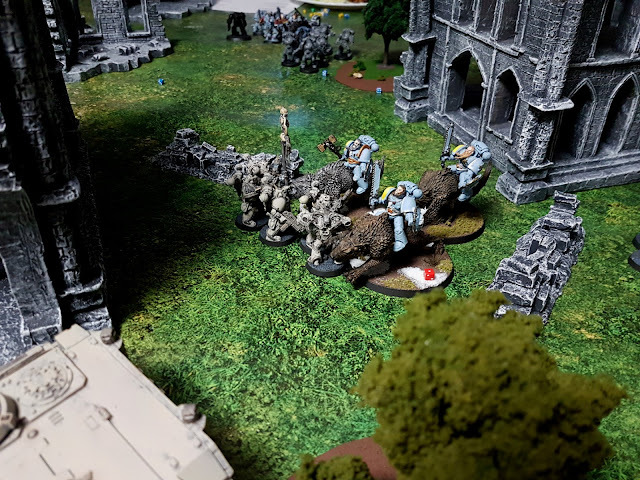 My Rhinos where getting blocked by my own troops and I hadn't decided exactly how or where I was going to deploy everything. It was a bit of a mess. On the other side of the table I thought Sarah's advance was much more organized, however she felt that she had also setup her forces incorrectly; spreading her infantry across to large an area for them to effectively control. As the Space Wolves thundered towards my Plague Marines I began to move my troops into better firing positions. However my poor setup meant it would take me yet another turn to get them anywhere useful, and by that time I would have a force of Thunderwolf Cavalry supported by Wolf Guard Terminators and Grey Hunters within charging range. It seemed my faulty setup had doomed me. Sarah, however, had also made a mistake. 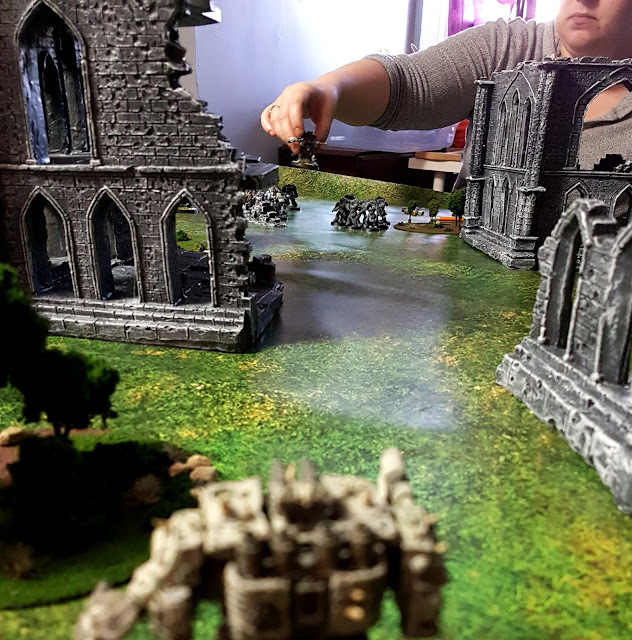 My Dreadnought (Hellbrute) had been able to move a full 18" thanks to a lucky "run roll" and by turn two I had a clean shot on her exposed HQ Njal Stormcaller with a Lascannon. My shot hit, and wounded, she failed her invulnerable save and given a Lascannon's strength, it was an insta-kill. Being "First Blood" and a "Slay the Warlord" Kill it was worth 3VP. A strong start for me and a devastating loss for Sarah: a look you can see in her face as she removed Njal from the board. 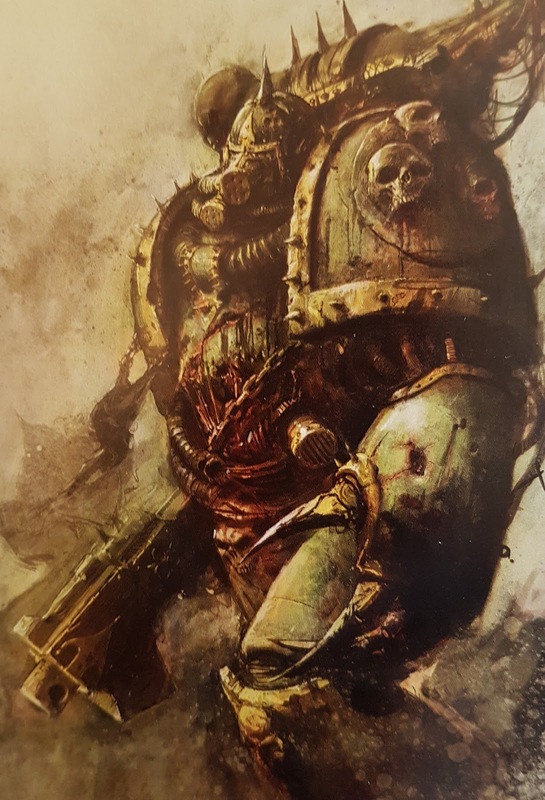 Though disheartened, her Venerable Dreadnought and additional Wolf Guard Terminators arrived during her turn strengthening her forces on her left. With these reinforcements she would break through my right flank in a turn or two. 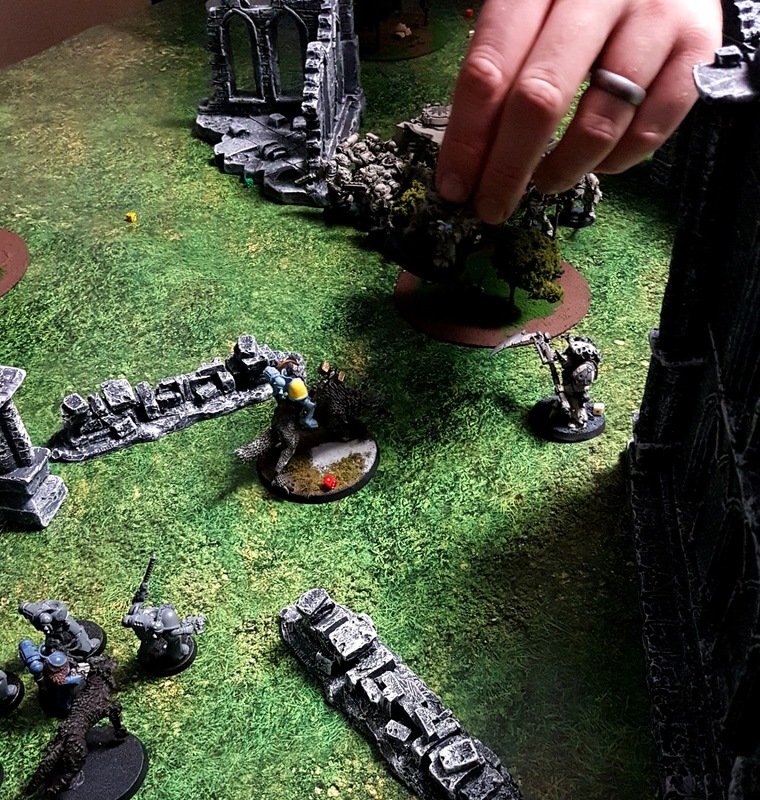 In a feeble attempt to hold the line, I blasted with my Dreadnought's Lascannon, only to have Sarah's Space Wolf Dreadnought shrug it off with a successful invulnerable save. I then positioned my Plague Zombies in a desperate plea to block and delay the coming assault. It worked! 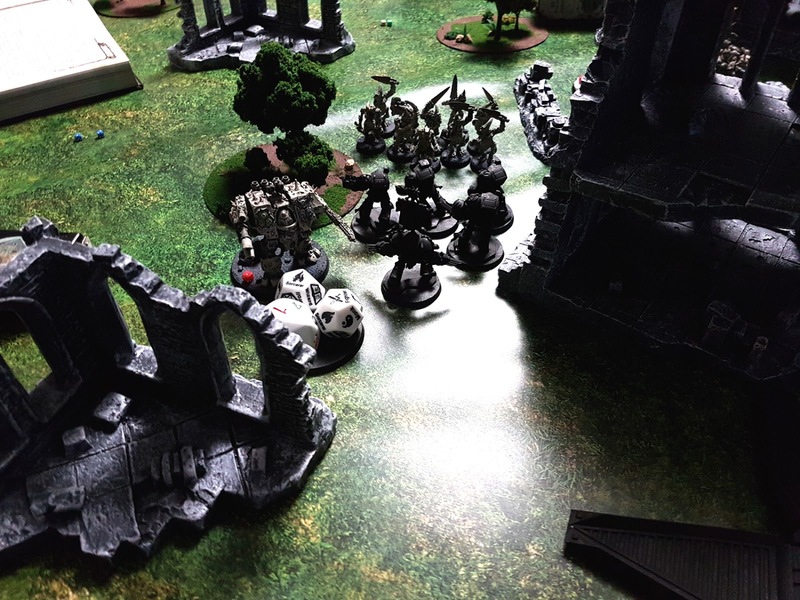 Sarah charged her terminators at my Plague Zombies, hoping to clear the 20 man obstacle as quickly as possible, and set her Dreadnought against mine, thinking that her dual close combat weapons and charge would give it a distinct advantage. Unfortunately she was wrong. Her Dreadnought only managed a single glancing blow, while mine got a penetrating hit and I rolled 6: Vehicle Explodes. Even with the Venerable Re-Roll, I rolled yet another 6 and its fate was sealed. The Score was now 4 to 0 Plague Marines, and Sarah's morale was shaken, but it wasn't over yet. 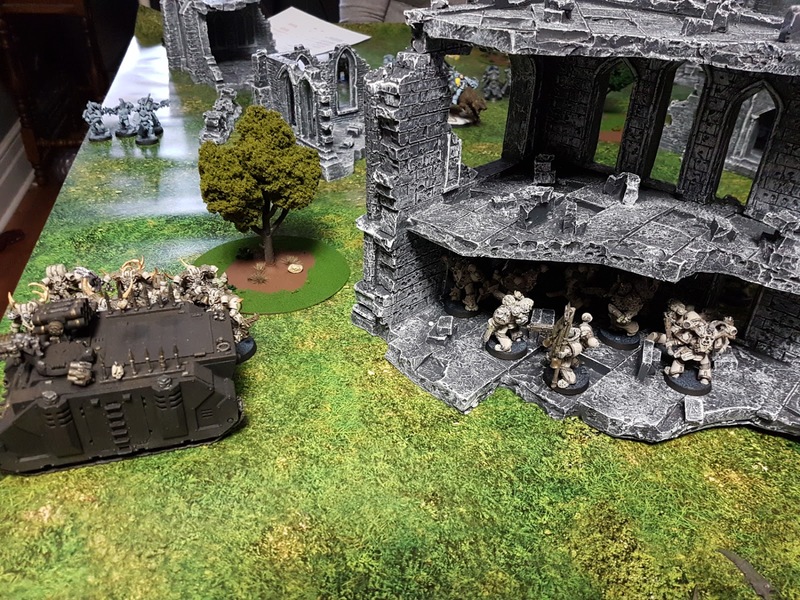 As I mopped up a small squad attacking my left flank (giving me yet another victory point), I fired a few volleys at the Thunderwolves that were getting dangerously close; but no luck, not a single shot landed, not even the plasma. Using their great speed Sarah charged ahead and into my line of Plague Marines. The rolls were in her favour and she cut my force in half, while I only dealt a handful of blows and did not take down a single wolf. It was now 5 to 0 Plague Marines, but the tides were changing. I was running out troops. My 5th turn was a disaster. My shooting phase was a waste, and during my assault phase I lost my Plague Zombies on my right flank, followed by Plague Marines in the center of the board. I had anticipate loosing the Plague Zombies (that is what they are for), However not wanting to lose the Plague marines I had tried to support them with my Plague Lord, but his attacks fell short. The dice had turned against me, but he was still standing. While my round was a disaster, Sarah's round on the other had was exactly what she needed. After some Storm Bolter fire, her five terminators (four with power/chainfists) attacked my still standing Dreadnought. I didn't event take down one Terminator before she pummeled it to ruins. The remaining Thunderwolf Cavalry in the center of the table then charged against my Plague Lord, and again the dice failed me. Her power weapon wielding wolf took him down dealing 3 wounds and granting her first "Slay the Warlord" bonus, while I didn't score a single hit. In a single turn she had tied the game. It was 5 to 5, and could go any way now. And things were getting desperate. Battle Leader, 2 Grey Hunters and a Thunderwolf. My gamble paid off. 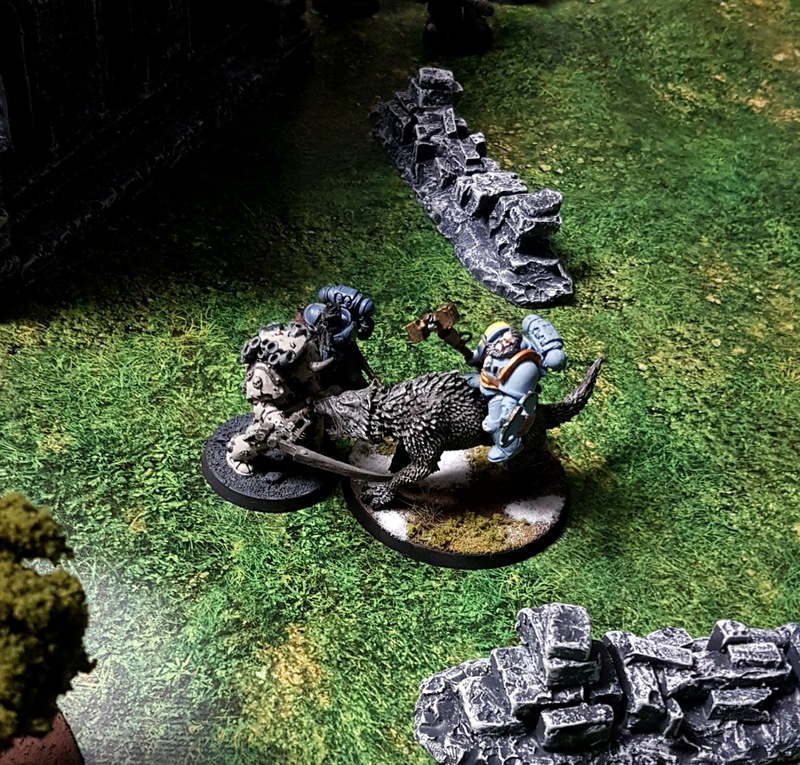 And while Sarah was able to take out one of my rhino's giving her a total six points, Typhus wiped out the remaining Grey Hunters and the Battle Leader and Thunderwolf were not able to take him down. Our game ended here at a tie. My Plague Marines had destroyed 4 units and Scored 6 points, Sarah's Space Wolves had destroyed 5 units and also scored 6 points: a Tactical Draw. Honestly I really screwed up here and only by virtue of some lucky rolls was I able to tie this game. My lucky shot against Njal, was a well exploited mistake, and the destruction of the Venerable Dreadnought was a lucky hit in my favour that gave me an incredible lead. But in the end my initial army design and placement of my units really effected my game. I even had a Squad of ten Chaos Havocs, that due to my indecisiveness were never able to to fire their heavy weapons. By the time I had a fair shot with them the game was over. It was a waste of squad that I could have use to support my lost Plague Marines who fell to the Thunderwolves on Turn 5. Next time I plan to rework this army into a more effective fighting force, and pay way more attention to my setup. Our next battle is actually happening the evening that this was posted so I will certainly have updates on how our force changes effected the battle soon!